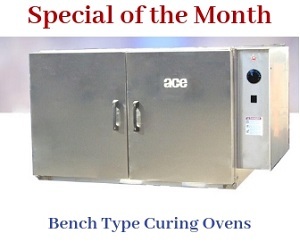 The ACE Burn Off oven model 490-RT is exclusively designed to remove combustible materials, or powder coat parts such as fixtures, racks, and hooks. This oven ensures complete part cleaning without using acids, solvents, or other hazardous cleaning materials. Hence, there is no pollution or hazardous waste generated during the heat cleaning process. This radiant tube burn off oven features heavy duty construction using materials that can stand the test of time. Its steel enclosure and aluminized coating add to its reliability and durability. The model 490-RT is largely preferred for engine rebuilding, automotive part rebuilding, electric motor rewinding, and plastic extrusion applications. Primary Burner off on Loss of A.B. Blanket Insulation 4" Thick 2,300°F. Oven Volume 83.00 CU. FT.